The 2018/2019 Tecnica Mach1 HV 130 was tested in the men's All-Mountain wide category at Silver Mountain Resort by the experts at America's Best Bootfitters, powered by Masterfit. 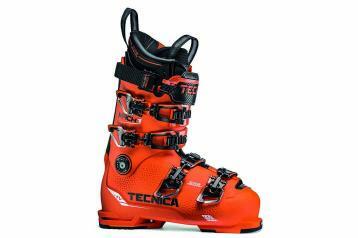 Testers say that the newest addition to the Tecnica line, the Mach1 HV 130, is the perfect example of how the DNA of a top-shelf narrow boot should be passed down to its wide-last brother. All the dominant family traits (stance, power, quickness, comfort) remain intact, and without any downside, testers said. Testers suggest that with the arrival of the new 103 mm Mach1 HV and softer Mach Sport HV lines Tecnica has the most well-defined group of narrow, medium and wide All-Mountain boots on the market. The Mach1 HV 130 (and 120) are the "performance wides" of the now two-tiered HV group. The Mach1 HV 130 is distinctly wider and more open through the instep and at the boot cuff than its narrower bro, MV in about the same amount of differentiation as the MV is from the LV, testers said. The Mach1 HV 130 is designed to perform as well as both the other Mach1's and as such has a still-firm feel in the ankle and heel. Testers said this is no bucket, but will make a lot of thick footed rippers very happy. For those looking for a boot where the premium is placed on comfort with some limited trade-off in performance, the Mach Sport HV boots (not tested) may offer a perfect match. Testers were hopeful that the 103 mm Mach1 would deliver on the performance promises made by virtue of their experiences with the LV and MV Mach1's and they were not disappointed. Test forms were filled with many comments that the line-up had not lost a step in stepping up the volume of fit. Solid, powerful, quick were oft-used terms to describe the HV's descent attitude. Some testers said the flex was a little shy of the 130 mark established by MV and LV. The Custom Adaptive Shape (C.A.S.) bootfitting features are the same here as they are on all the Mach1 boots for men and women—the C.A.S. shell is dimpled in common fit problem areas to aid with heat stretching and the C.A.S. liner is both heat moldable and grindable. In addition to these helpful fitting tools, the Lift Lock buckles are handy—they stay locked open when pushed to their end stop and the Power Lock power strap hook-in-loop connection sidesteps having to thread the strap webbing through a cam-lock buckle every time.